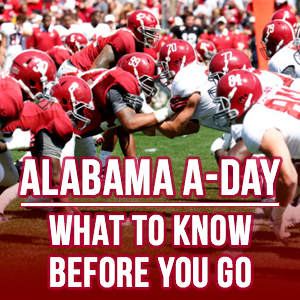 MOBILE, AL – With Alabama’s annual spring football game, known as A-Day, coming up Saturday at 1 p.m. we’ve got the details on how, when, and where to keep up with all the action. The gameday activities begin with the Mercedes-Benz Fan Fest starting at 8 a.m. adjacent to Bryant-Denny Stadium. The event will feature giveaways, live radio, and sampling events, and it’s open to the public. Food vendors will also line Walk of Champions Plaza starting at 8 a.m. Trophy displays for the Crimson Tide’s Sugar Bowl and National Championship in 2017 will also be available at 8 a.m. at the Mercedes-Benz Fan Fest. Alabama’s alumni game will take place in Bryant-Denny Stadium at 10:30 a.m. and it features former standout players from the program. The game will have two 20-minute halves. At 11:15 a.m. Alabama’s Walk of Fame ceremony will begin. It is open to the public, and Nick Saban, along with the 2017 team captains, will address the crowd and make handprints in the concrete at Denny Chines. The Walk of Champions is scheduled for 11:50 a.m. when the team will arrive at Bryant-Denny Stadium. The game kicks off at 1 p.m. and will feature the two quarterbacks, Jalen Hurts and Tua Tagovailoa. Alabama’s baseball and softball teams are playing Saturday as well after the spring football game. The Tide’s softball team plays Tennessee at 4:30 p.m. at Rhoads Stadium, and the baseball team will host Auburn at 7 p.m. at Sewell-Thomas Stadium. If you are unable to attend the game, it will be televised on ESPN and available online at WatchESPN. For more information, tune in to WNSP for Sports Drive weekday afternoons from 3 p.m. to 6 p.m.